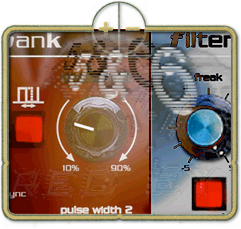 Wth the introduction of our new NovaMusik partnered synth, the "RED EYE" came two fresh sets of patch banks: Diademer and Infared. Bank 5 "INFARED" is the lovechild of a most brilliant sound designer who will continue to remain nameless, due to reasons that must also remain veiled. This man knows his Arps and his Junos and his Techno; very clever and inspiring voicings make this "patch-work" an essential compliment for your SE-1(X) patch library.